To commemorate the release of my first artbook, I decided to hold a giveaway!!! Full details can be found here on deviantART. Giveaway ends on May 4th, 2016, 11:59 PM CDT. Winner will be announced on May 6th, 2016. -WIPs of artwork that didn’t make it into the book! My patrons will get access to all of this and more in the coming weeks! Preordered items will not ship until after the preorder period closes (6/10). Don’t worry if Storenvy sends you an email about this; your order will be shipped out shortly after June 10th. If you’d like to stay up to date, please follow me on social media, as I will give updates on the status of packages there. Q. What if I miss preorders? How long do I have to wait for regular orders to open? Regular orders will open after all preorders have been shipped. Q. Will you be selling the preorder extras (stickers, etc.) separately as well? The sticker sheets and limited-edition print (available in Set A and Set B) are available only as long as supplies last and will not be reprinted or sold separately. Charms will be not be available separately until August 2016. Q. Can I order other things in your store at the same time? Yes! Keep in mind that if you order other items along with your preorder (such as stickers or prints), they will ship when your preordered item ships, in order to save shipping costs. Yes! I will be selling the book (by itself) at conventions as well (if I have a confirmed table). 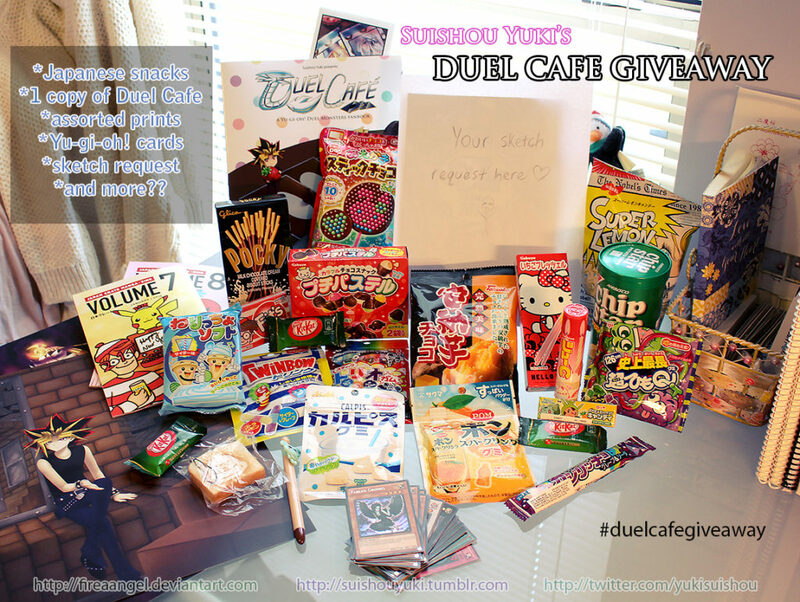 Posted in AnnouncementsTagged artbook, charms, dm, duel cafe, duel monsters, fanart, fanbook, giveaway, japanese snacks, order, preorder, prints, stickers, ygo, yu gi oh, yugiohLeave a Comment on Duel Cafe Preorders Open + GIVEAWAY!